Your relationship data when and where you need it. You worked hard to build a relationship with your customer and you want to keep that relationship solid. Base stores all call records, call recordings, notes and emails between your company and the customer on one single card. Your leads come from a variety of sources. Lead management in Base helps you organize leads and assign them to the right sales reps so they can be followed up on and qualified quickly. After being qualified, convert a lead in Base and all of the contact information you have about your lead is transferred your new customer contact card. Optionally, you can specify follow up tasks and even create a deal at the same time. Your CRM should be ubiquitous. 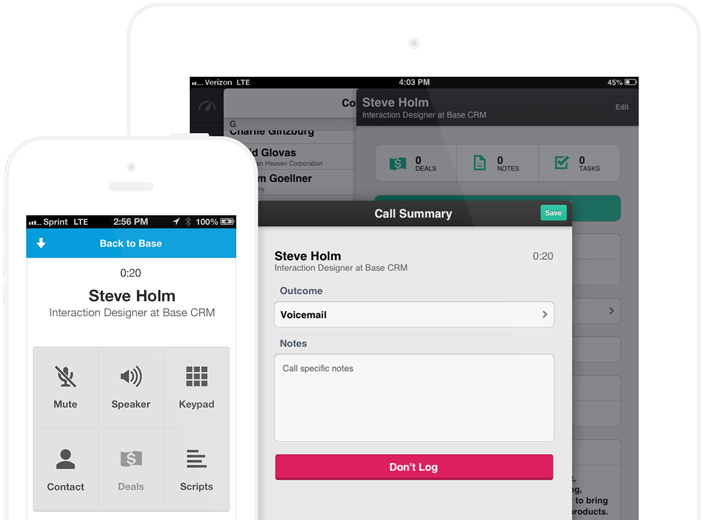 The days of waiting to get back to the office to update your CRM are over. No matter where you go, Base is along for the ride. Access Base using dedicated, native mobile CRM apps for iOS, Android and Windows Phone to complement the robust web application. Record and playback your calls. The information you need to drive results. Out of the box visual sales reporting gives you immediate access to the insights you need to run your business. Stay organized with your Base insights dashboard and always know what items need your attention.